We're about to enter a somber period called Petsa de Peligro. During these bleak days we do everything to survive ‘til payday comes—bring packed lunch to work, look for spare coins in our bags, and drink 3-in-1 coffee. Sometimes, we even pretend that we’re on a diet just so we could skip a Friday night out. But just like other tough times, Petsa de Peligro will pass, too, and the smell of hard-earned cash will finally reach our hands. Now, there are many things you can do once you get your money (pay this, buy that), but there's one thing most Filipinos will automatically splurge on: food. 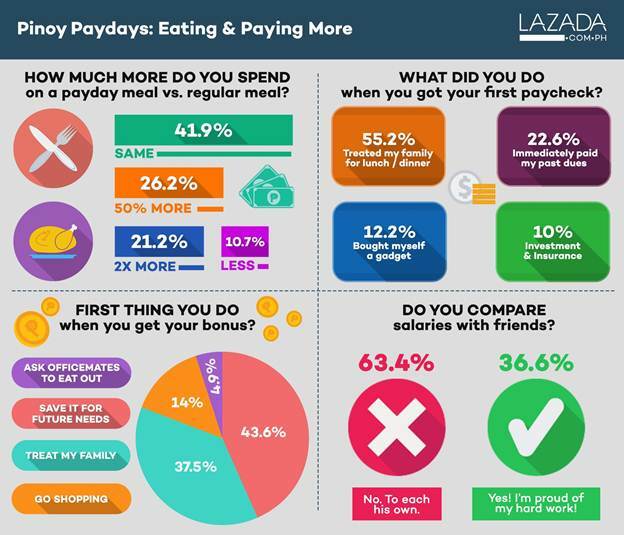 In an online survey, Lazada Market Intelligence discovered that 47.4 percent of working class Pinoys spend more on food during payday. 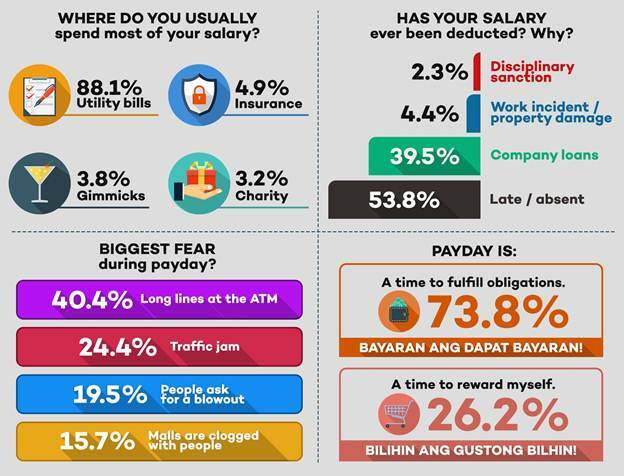 Of the 345 respondents, 26 percent say that they spend 50 percent more while 21 percent claim to spend up to twice as much for their payday meals. 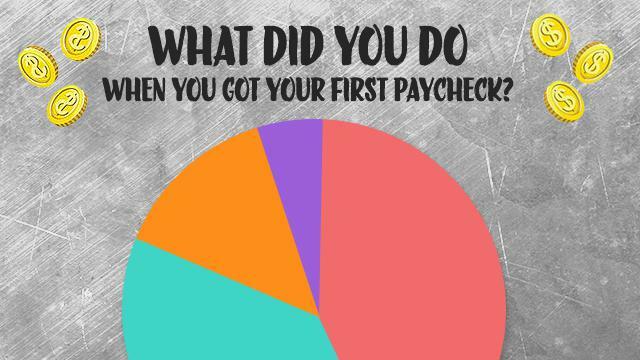 More than half of the respondents also said that they spent their first paycheck treating their family to a meal—colloquially known as the "blowout." But where do the rest of their earnings go after celebrating? 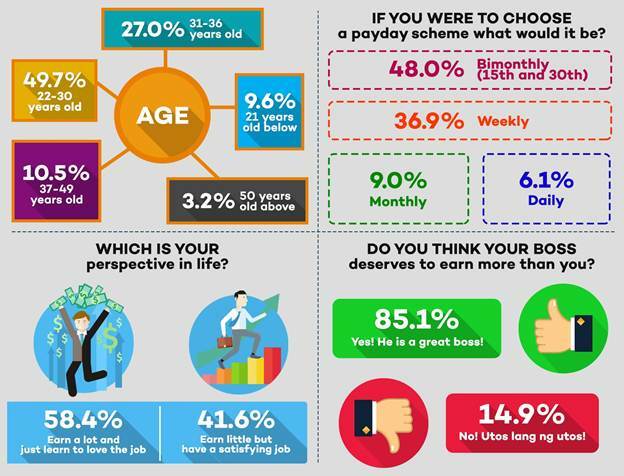 A whopping 74 percent of respondents immediately think of the bills they have to settle whenever payday approaches. Eighty eight percent of them say that electricity, water, phone, rent, credit card, and other utility bills take up the bulk of their salaries. Nevertheless, despite all the blowout and bills to pay, Lazada shares that Pinoy workers still know how spoil themselves. The online shop's sales data shows that purchases on surges every 15th and 30th, with the most number of items sold in the health and beauty category. Lazada is launching its Payday Sale this May 30 to June 2. Check out their official Facebook page for more details.